An international research group led by Professor Michio Homma at the Graduate School of Science, Nagoya University has elucidated the mechanism of a bacterial flagellar motor powered by hydrogen and sodium ions. Their paper was published online in PNASon February 17, 2014. Bacteria rotate their flagella for propulsion. Flagella inEscherichia coli use hydrogen ions to move and rotate 20,000 times/min. Despite this high rotational speed, flagella can switch their rotational direction instantly. Thus, they have high performance and functionality that cannot be achieved with current technology. Because flagellar and artificial motors have many common structures, researching the E. coli flagellar motor can contribute to the development and improvement of artificial motors. Professor Homma's research group had previously created a chimera of E. coli and Vibrio, a pathogenic bacterium, and succeeded in expressing E. coli flagella that were powered by sodium ions. In their latest study, his group implanted E. coli with genes that used sodium ions to generate rotational energy and created a hybrid-fuel bacterial flagellar motor that uses both hydrogen and sodium ions as power sources. This motor is powered by hydrogen ions when E. coli is in a hydrogen ion-rich environment, and it switches its channel according to environmental conditions and is powered by sodium ions when E. coli is in a sodium ion-rich environment. The mechanism of theE. coli flagellar motor is similar to that of a hybrid car that changes its power source between a gasoline engine and an electric motor based on driving conditions. The results are expected to contribute widely to the planning of artificial nanomachines in the future. 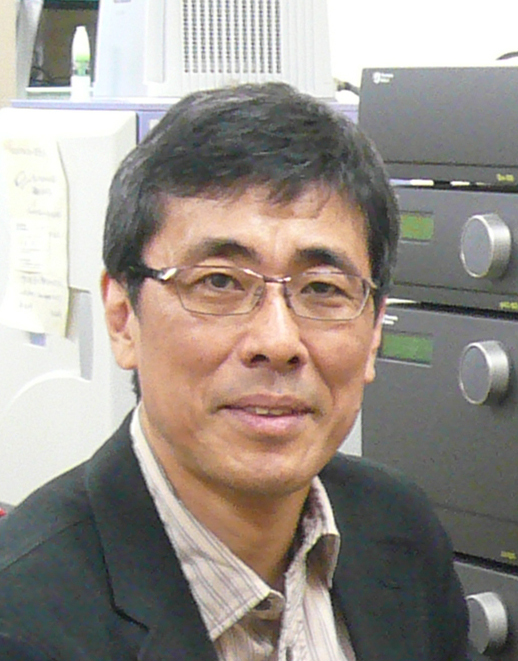 Professor Michio Homma has researched bacteria, fungi, and flagella at various research institutes. His current research interest was greatly influenced by his former teacher's research on flagella. He aims to elucidate the mechanism underlying the locomotor apparatus of living organisms by collaborating with researchers from various fields and countries. When I talk about my research on the mechanism underlying microorganisms swimming using flagella, people speculate the value of my research. I would like to explain that an energy-conversion mechanism is necessary for biological locomotion, and to make people realize that my research is fascinating regardless of its practical use. I strive to convey how fascinating research is to students who are assigned to my laboratory. When I was a college student, I asked myself about the meaning of life. To find an answer to this question, I thought it was important to understand living organisms. Thus, I chose biology as my research discipline. I encountered this research topic by chance during my graduate studies, and since then I have persistently pursued research on this. I believe that no research is interesting at the beginning, and that it is up to us to make it interesting. I hope you will find it fascinating to unravel the mysteries of life.